In 2005, MASS MoCA (Massachusetts Museum of Contemporary Art) presented a monumental and uniquely American sculptural installation by Dave Cole. 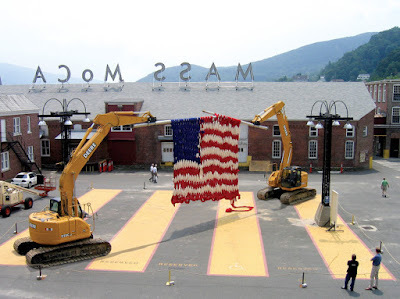 Cole’s project The Knitting Machine comprised two excavators specially fitted with massive 20′ knitting needles which produced an oversized American flag, which can be seen as both a celebratory gesture of pride and a commentary on America’s role in world affairs. When the flag was removed from The Knitting Machine it was folded into the traditional flag triangle and was on display in a presentation case which Cole described as slightly smaller than a Volkswagen Beetle, accompanied by the 20′ knitting needles, and a video of the knitting process. Enjoy Veterans day, go hug a Veteran!